(CNN) -- In all the interviews and conversations, it hadn't come up. To the sisters, it was just a job they'd held a long time ago, when they were teens with a talent for numbers. To filmmaker LeAnn Erickson, it was history rediscovered. It was 2003 and Erickson was interviewing sisters Shirley Blumberg Melvin and Doris Blumberg Polsky for her documentary, "Neighbor Ladies," about a woman-owned real estate agency that helped to peacefully integrate a Philadelphia neighborhood. The twins, long-retired by then, reluctantly mentioned a different sort of job they'd held during World War II: Female "computers." It wasn't factory work, but they were "Rosies" nonetheless, filling jobs that men would've taken if they hadn't been at war or wrapped up in other military research. "I said 'What are you talking about?' " Erickson recalled. "I'm an amateur women's historian, but I'd never heard about this -- white-collar women who worked doing math and science under the radar? I didn't know." Erickson, an associate professor at Temple University, didn't think others knew the story, either. The memories and witnesses were fading, she realized, and with them, the truth behind women in technology and the first computer programmers would go, too. Erickson's mission to recover the past became "Top Secret Rosies: The Female Computers of World War II," a documentary that debuted last year and was released on DVD last month. 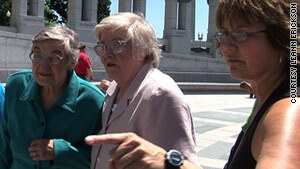 Shirley Blumberg Melvin, Jean Jennings Bartik and LeAnn Erickson visited the National WWII Memorial. "There were lots and lots of women, thousands of women doing this kind of work all across the United States," Erickson said. "We just don't know it." Erickson's documentary focused on women plucked from high schools and colleges to work at the University of Pennsylvania in the 1940s. They moved into dorms and apartments and went through a rigorous introduction to ballistics calculations in order to do the job. It paid well, and the women were close. They played bridge, shared dinners and danced together in the university gardens when the war in Europe ended. Still, they struggled with the knowledge that their calculations -- so precise they measured whether an enemy soldier was standing up or lying in a trench -- were used at war. 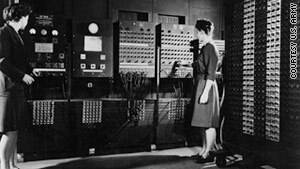 Jean Jennings Bartik was one of the women computers. In 1945, she was a recent graduate of Northwest Missouri State Teachers College, the school's one math major. She lived on her parents' farm, refusing the teaching jobs her father suggested, avoiding talk of marrying a farmer and having babies. Bartik was waiting on a job with the military. When a telegram arrived asking her to come right away, she took a late-night train and began new career in Philadelphia. She learned the hand calculations, and saw the clunky old analyzer used to speed up the process. Its accuracy depended on the work of her colleagues, and a mechanic who serviced its belts and gears. The war ended in 1945, but within a couple months of arriving in Philadelphia, Bartik was hired to work on a related project -- an electronic computer that could do calculations faster than any man or woman. The Electronic Numerical Integrator and Computer, created by Penn scientists John Mauchly and J. Presper Eckert Jr., weighed more than 30 tons and contained about 18,000 vacuum tubes. It recognized numbers, added, subtracted, multiplied, divided and a few other basic functions. Men had built the machine, but Bartik and her colleagues debugged every vacuum tube and learned how to make it work, she said. Early on, they demonstrated to the military brass how the computer worked, with the programmers setting the process into motion and showing how it produced an answer. They handed out its punch cards as souvenirs. They'd taught the massive machine do math that would've taken hours by hand. Other than a shared certificate of commendation from the military, the programmers and their hand-calculating counterparts got no recognition. "We thought that was terrible," said Bartik, now 86. "It was not a secret. The only problem was nobody was interested. They didn't know anything about it." After the war, several of the women featured in "Top Secret Rosies" got married, had children, and worked to further their husband's careers or build family businesses. But the wartime experience and connections later brought some of them back to computers. Bartik's computer career continued with the development of BINAC and UNIVAC computers and paved the way for other women to work in math and technology fields. "When the war came, you needed everybody," Erickson said. "That threw open the door to women that had these skills and would have languished as bookkeepers or secretaries. "They had goals, and their kids were along for the ride." Jean Jennings Bartik and Frances Bilas Spence prepared to unveil ENIAC in 1946. But their work during the war was little known, unacknowledged or left out of official histories of the war and the development of computers. Researchers and historians point out their work was somewhat secretive and never intended to be recognized outside the military. Because of the culture of the time, the women computers were always considered temporary replacements for men. "I don't feel these men had any evil intention," said Carolyn Leighton, founder of Women in Technology International, referring to the ENIAC creators. "It's just reflective of a mindset that existed then and exists now, to a different degree. Without question, there are just tons of amazing women in science and technology that nobody knows about." Within the accepted history of computers, hardware innovation is celebrated while software and programming has been ignored, said Jon Rickman, vice president of information systems at Bartik's alma mater, now known as Northwest Missouri State University. "It's just so much easier to be enthralled by the massive complexity of the ENIAC, and not what it took to make it do something," said Rickman, who is helping to edit Bartik's autobiography being released later this year. "A computer is a pretty useless device without programmers." Since "Top Secret Rosies" debuted, Erickson has taken the show on the road to schools and small theaters. There were so many requests, she's extended the tour. There's almost always a "Rosie" of some kind in the audience. The crowd always cheers. To keep sharing the story and correcting perceptions of a men-only computer history, Erickson is developing teachers' guides for the documentary to be used in classrooms. "We just don't pay attention to what women do," Erickson said. "Despite the fact that women helped the war effort, we don't know." In 1997, Bartik was inducted into the Women in Technology Hall of Fame, along with her fellow ENIAC programmers, Kathleen McNulty Mauchly Antonelli, Frances Snyder Holberton, Marlyn Wescoff Meltzer, Frances Bilas Spence and Ruth Lichterman Teitelbaum. In 2008, Bartik was one of the Fellow Award honorees at the Computer History Museum in Mountain View, California, along with Robert Metcalfe, an inventor of Ethernet, and Linus Torvalds, who began the development of the Linux kernel. The most important part of all of these stories is how we can use them to shape the legacy for the next generation of women. Back in Missouri, Bartik's alma mater became the first public U.S. college to install computer terminals, telephones and cable TV in every dorm room. By the late 1980s, more than 6,000 students there were communicating by e-mail and reading stories from the student newspaper on computer screens. History lives on there, too, at the Jean Jennings Bartik Computing Museum. Bartik misses her friends, such as Kay Mauchly, who married ENIAC creator John Mauchly after they worked together on the computer. The women were among the only ones who understood what it was like to be working in technology just a few decades after women had won the right to vote. "Every time people gave me something for the museum, I'd call Kay up and we'd talk about it," Bartik said. "Kay and I adored each other. When she died, that was the last person." But Bartik already sees her legacy in action. Her children are good with numbers, too, and work in bookkeeping, economics and computers. Her granddaughter wants to be an engineer. Bartik is comfortable with computers, and sometimes uses her daughter's laptop to play bridge. Women haven't gotten far enough in technology fields yet, Bartik said, but she's hopeful. Rediscovering the role of WWII's women computers will help, said Leighton, of Women in Technology International. "The most important part of all of these stories is how we can use them to shape the legacy for the next generation of women," Leighton said. "We know now, without question, how role models can inspire and affect choices. It's not only for them, but the young women and men we can inspire."